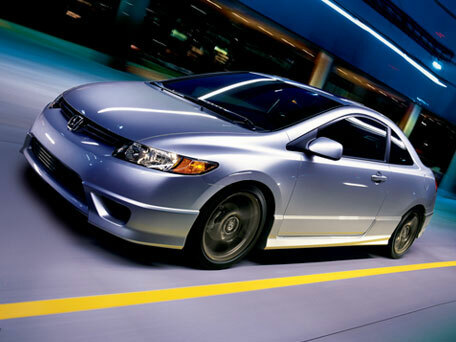 With a 140 horse power i-VTEC engine, the Honda Civic Coupe provides a truly pleasurable experience. The car has some of the best features. One of these features is of ‘sophisticated suspension’ that will allow you to have excellent steering control on the vehicle. Its 5-speed gear can be operated both manually and automatically according to the needs of a driver. Its excellent disc brakes provide powerful control even at high speeds. Its sleek exteriors give it an admirable and sporty look. This sleek looking car is a wonder package with seating space for five and a rear floor that is absolutely flat. The interiors also include stylish sports steering wheel that has the audio control feature mounted on it. Not only is the exterior of the car sleek, it also has a futuristic look which makes it a great art piece. The vehicle is also considered to be one of the best fuel efficient vehicles. In fact, it has been categorized as an Ultra-Low-Emission Vehicle in more than fifty state in different countries around the world.